I like alleyways. Albeit not after the hours of darkness. There is something strangely liberating about scurrying through these little pedestrian short-cuts away from the thundering (or grinding) traffic. Yet increasingly we are seeing alleyways closed off. The problem is that many of these passages are not, as is commonly assumed, public footpaths but are privately owned pieces of land belonging to the surrounding residential properties to which they provide rear or side access. The increasingly common practice of 'alley gating' is touted as an effective measure to prevent fly-tipping and reduce burglaries and incidents of anti-social behaviour and as such is supported (and in many cases subsidised) by local councils. If planning permission is granted by Merton Council the alleyway which runs between Trafalgar Avenue and Garth Road in Worcester Park (a popular short cut especially for those accessing the 293 bus stop) will shortly be gated off. I would be quite surprised if there is a particular problem with anti-social behaviour here. 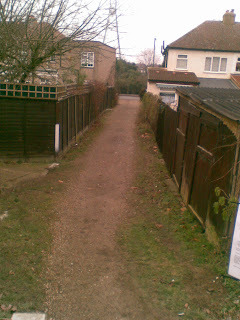 The passageway is right at the end of 'Pigs Alley'- a secluded public footpath running from Trafalgar Avenue, past The Hamptons development and through to Green Lane - which is surely much more of a magnet for potential anti-social behaviour than this innocuous looking alleyway. Yet as we are dealing with privately-owned lane, there is little that can be done to prevent such alleys from being gated off. Which is good news for those who share ownership of this little strip of land but bad news for those who prefer two legs to four wheels. Bring on the alley gaters!